I recently drove past the Singapore Art Museum. Something caught my eye; to be exact, something that was missing caught my eye. Sitting out in front of the museum for over 10 years was a very tall, partly-angular, partly-spherical sculpture (see photo on the left). 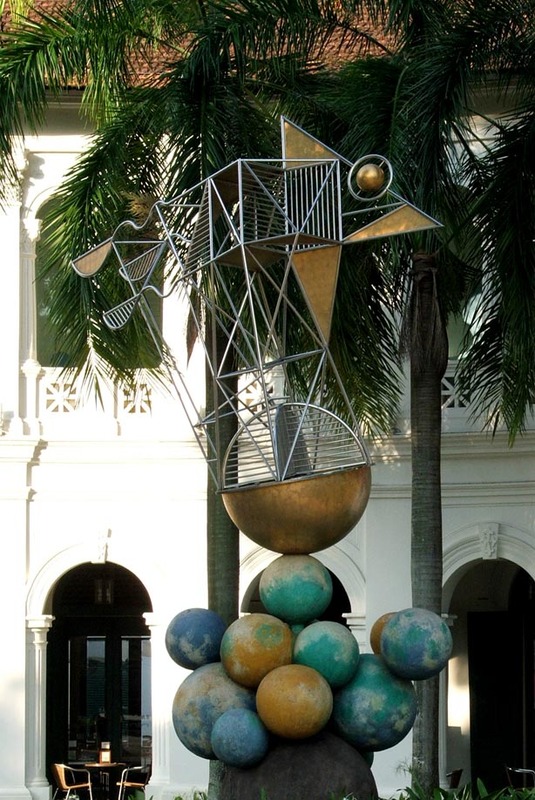 This was local sculptor Ng Eng Teng’s ‘The Explorer’. I’ve always got a soft spot for Eng Teng’s works, for I was only a tot when I stood in awe of his huge mother-&-child sculptures at the Plaza Singapura (in the 70s, way before it was renovated). You can still see these magnificent alien-like sculptures in front of Far East Shopping Centre and NUS Museum. But I must say that ‘The Explorer’ was not Eng Teng’s finest hour. According to this (click ‘here‘), the Singapore Art Museum had commissioned Eng Teng to produce the sculpture to see-in the new millennium in 2000. I think the museum gave Eng Teng a very free hand. The result was a sculpture that an awkward mish-mash of organic pasty-coloured spheres jarringly mounted by stainless steel and cheap-looking bronze-plates masquerading as some sort of satellite (???). According to this source (click ‘here‘), the sculpture was unveiled by then DPM Lee Hsien Loong no less. Anyway, I bet Eng Teng would’ve never guessed that his ‘Millennium’ sculpture would’ve lasted all of 11 years only. That’s 909 years short! As mentioned, the sculpture is now gone without any fanfare (i.e. no media coverage). I at first had thought that the sculpture was removed to facilitate some kind of construction works, but that seems unlikely as the front of the museum was untouched by any works (and furthermore, the MRT station-works has already been completed, and therefore would not warrant the sculpture’s removal). This was a case of ‘good-riddance-to-a-commissioned-hideous-sculpture-after-politley-being-displayed-for-11-years’? Well, whatever the reason for its removal, I am one who believes that tastes in art, just like fashion, comes and goes according to the times. Therefore, I’ve got no problem for this sculpture to be taken down in favour of something else. However, I’m pretty sure that SAM had probably communicated with Eng Teng that the sculpture was to be up for a lot longer than 11 years – judging by the ‘millennium-status’ of this commission – but then deciding to end its ‘permanace’ due to its unflattering aesthetics clashing with the genteel facade of the colonial building. What would Eng Teng – who had passed away in 2001, one year after the installation of what would’ve been one of his last, big projects – have to say about this? I hadn’t even noticed ! Gosh, talk about not paying attention … Thanks for pointing it out, otherwise another slice of local art history might have just silently gone the way of the dodo.